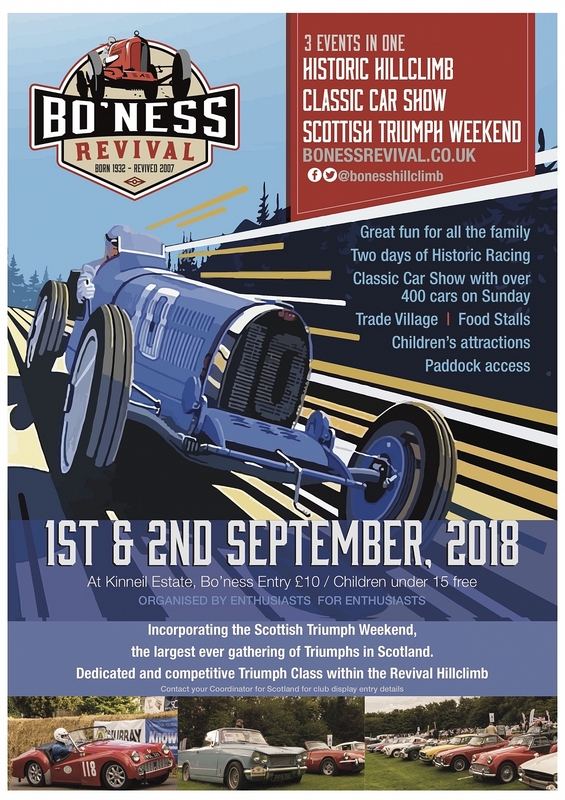 The Bo'ness Revival is two events in one in that there is a full programme of historic motorsport on both Saturday and Sunday in the form of the Bo'ness Revival Hillclimb, which includes a TR specific class sponsored by the TR Register. 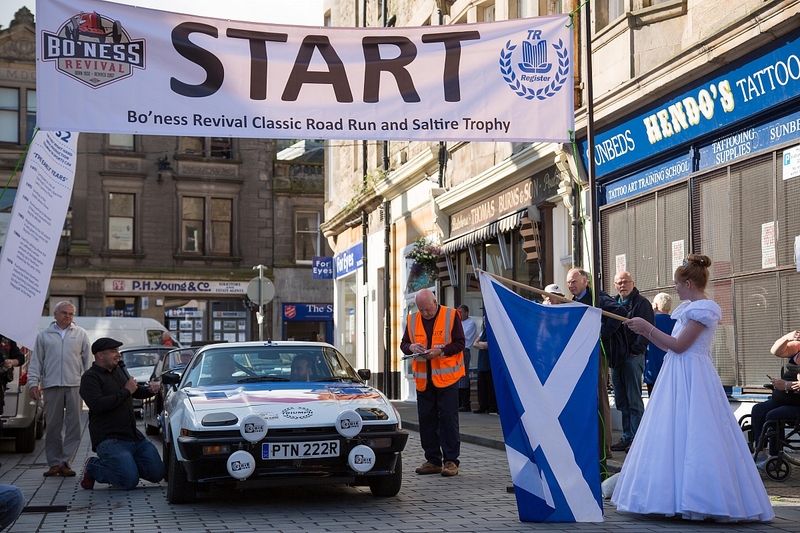 The Bo'ness Revival Classic sees an action packed weekend event for Classic Car owners, featuring trade stalls, over 30 car club displays, action arena and family entertainment. An additional new feature at the 2018 Bo'ness Revival shall be the Scottish Triumph Weekend, supported by all of the major Triumph Clubs, which hopefully shall see the largest ever gathering of Triumphs at a single venue in Scotland. See, hear and smell Scotland's oldest motorsport venue roar into life, as legendary racing machines from across the ages, fiercely compete across two full days, to be the fastest up the challenging Bo'ness Revival Hillclimb. Bo'ness saw Scottish motor racing heroes like Jim Clark and Sir Jackie Stewart rise to fame on the tarmac at Scotland's first true motor racing venue. Every year at the Bo'ness Revival, we celebrate over 80 years of hard fought racing at the venue, with a selection of competing cars from the early 1900s right the way through to the late 1980s. Don't be fooled into thinking this is some kind of classic car parade though, these guys mean business and you can watch them battle it out against the clock across two days of exciting, flat out racing action guaranteed to get your pulse racing! Competitors travelling from across the UK, face a challenging tight and twisty course, which always delivers plenty of fast, sideways action. The cars are split into 16 different classes according to age, power and engine size and race across two days. You get access to the paddock areas so you can get up close to these racing monsters and chat to the drivers, whilst steam trains pass above you on the Kinneil Railway! Out on the track, you are as close to the action as possible at every corner. This is a drive in and around the Borders area of Scotland to be undertaken at a pace chosen by the individual entrants. The Tour shall start from the Bo'ness and Kinneil Railway station in Bo'ness town centre where entrants shall be flagged away by the Bo'ness Fair Queen. Wayne Scott shall be on hand with his trusty microphone to chat to entrants as they prepare to set off on the circa 110-mile round trip. A two course lunch is on offer at the mid-way break at a cost of £15.00 per person. Also starting from Bo'ness station the BST is an MSA sanctioned competitive event in the style of a production car trial and historic rally and consists of a Tulip Road Book with observation questions, four Autotests and two Regularity Sections. A competition licence or crash helmets etc. are not required. There is a separate entry fee of £65.00 for the BST. Last year saw two TR7 entrants so it would be great to see some more Register members give the event a try for 2018. Sunday shall see the TR Register Scottish TRs gazebo take centre stage on the TR Register stand. It shall be the hub for TR Register specific activities, including determining the winners of the various awards on offer for TR Register entrants. The TR Register sponsored Showfield Arena shall be the focus for activities all day, with interviews of owners with their cars and presentation of Bo'ness Revival and individual club awards, again all under the knowledgeable control of Wayne Scott who shall be ably assisted by Sam Colman who shall hopefully have recovered from the stresses associated with being an entrant of The Bo'ness Saltire Trophy the previous day. Staged in the Showfield Arena the Carkhana is open to all entrants of the Classic and usually sees an eclectic mix of vehicles including TRs to even a Hearse with their owners pitting their driving skills to the test. To participate at the 2018 TR Register Scottish Weekend please contact Cliff McKinnon at cliff@bonessrevival.co.uk or download and post the Application Form from HERE.